Impact craters on the moon reveal that the number of asteroid impacts increased dramatically over the last 300 million years. Here, a map of all the impact craters larger than 6 miles (10 kilometers) in diameter and younger than 1 billion years old. Like a motorcycle windshield splattering bugs on the highway, Earth's atmosphere is constantly deflecting tiny bits of extraterrestrial rock, dust and other space garbage that get in the way of our planet's 67,000-mph (107,000 km/h) joyride. Occasionally, that debris breaks through - as it did 66 million years ago, when an asteroid the size of Manhattan crashed into the Gulf of Mexico and killed the dinosaurs. That impact was singularly catastrophic. But, according to a new study published today (Jan. 17) in the journal Science, that smashup was also just one episode in an ongoing spike of gargantuan asteroid impacts bombarding our neck of the solar system. After studying 1 billion years of asteroid craters on the Earth and moon, the study's authors found that the rate of huge asteroid impacts on Earth has nearly tripled in the past 290 million years - and nobody's sure why. "It's perhaps fair to say it was a date with destiny for the dinosaurs," study co-author Thomas Gernon, associate professor of Earth science at the University of Southampton in the U.K., said in a statement. "Their downfall was somewhat inevitable given the surge of large space rocks colliding with Earth." 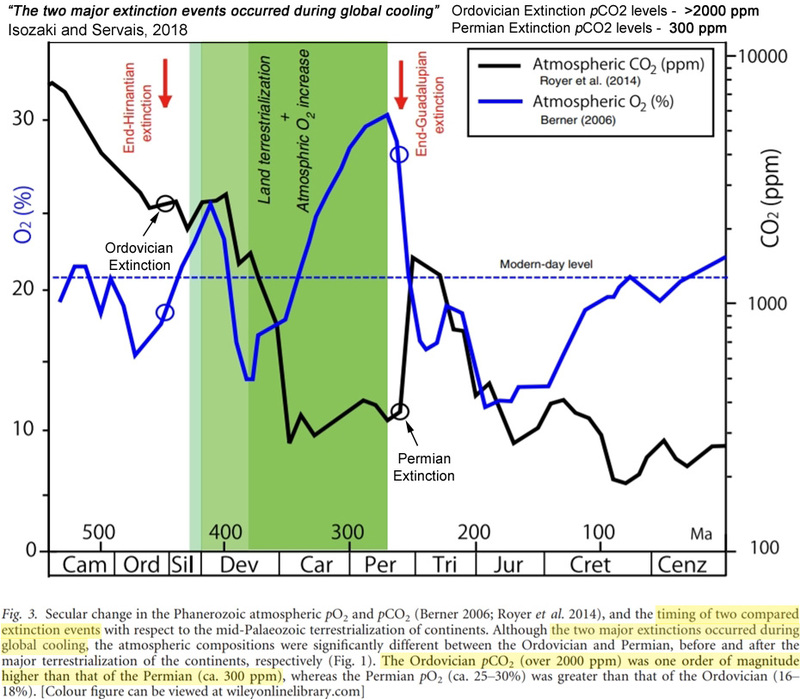 In the past it has been widely reported that high and abruptly changing CO2 concentrations during the Permian led to climate conditions that were "too hot for complex life to survive" on the planet. Today, scientists have determined that the opposite may be true: the Permian mass extinction event occurred during a period of global cooling, expansive ice sheet growth, relatively low CO2 levels, and a marine-habitat-destroying sea level drop of 100 meters. A year ago, the press release for a paper published in Scientific Reports argued that during the Permian mass extinction event, "the majority of marine species" were killed off by an "extreme cold" period that coincided with widespread glaciation and a dramatic drop in global sea levels. 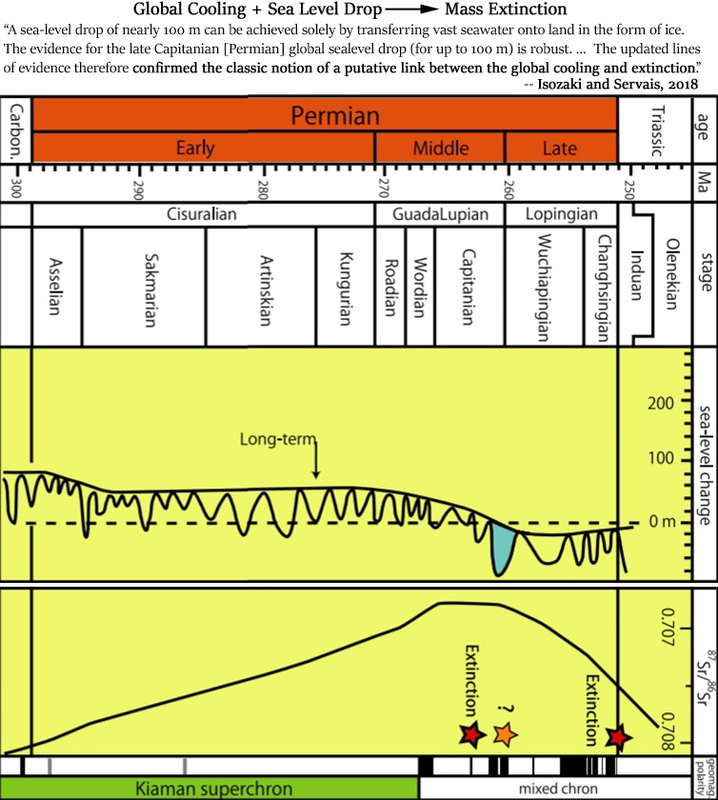 "Analysis of the newly dated layers showed a significant reduction of seawater levels during the [Permian] extinction event. The only explanation for such a dramatic decrease in water levels is a sudden increase in ice. The ice age lasted just 80,000 years, but the extreme cold was enough to kill off the majority of marine species." I had a blast last week joining the hosts of my favorite new podcast: Seven Ages Audio Journal. Like the Tusk, veteran podcaster Micah Hanks and his science bros Jason Pentrail and James Waldo attempt the difficult balance between hard science, responsible speculation and perhaps some entertainment. I think they recognized me as a "fellow traveler" in this regard, and were kind to invite me on as a non-PhD generalist researcher of the Younger Dryas Event. UNM Researcher Maya Elrick gathers samples on Anticosti Island. For decades, scientists have conducted research centered around the five major mass extinctions that have shaped the world we live in. The extinctions date back more than 450 million years with the Late Ordovician Mass Extinction to the deadliest extinction, the Late Permian extinction 250 million years ago that wiped out over 90 percent of species. Over the years, scientists have figured out the main causes of the mass extinctions, which include massive volcanic eruptions, global warming, asteroid collisions, and acidic oceans as likely culprits. Other factors sure to play part include methane eruptions and marine anoxic events-when oceans lose life-supporting oxygen. The niece of ex-spy Sergei Skripal has had her visa request to Britain refused for a second time. The Russian national was hoping to visit her relatives, Sergei and Yulia Skripal both of whom were poisoned with a nerve agent. Responding to the denial, a Home Office spokesperson said: "We have refused a visa application from Viktoria Skripal on the grounds that she did not meet the requirements of the immigration rules." Comment: The longer this goes on, the worse it looks for the UK. Jose Bustani, the first director-general of the global chemical weapons watchdog Organization for the Prohibition of Chemical Weapons (OPCW), sat down with RT and revealed how John Bolton, a Bush-era official and now Donald Trump's pick for National Security Adviser, bulldozed the way for the 2003 Iraq invasion. Bustani, a Brazilian diplomat, led the organization from 1997 until 2002, when he was ousted after falling out of favor with the US. At the time, he was trying to convince Iraq and Libya to join the organization, meaning that the two countries would have been obliged to dispose of all chemical weapons if they had any. Regarding the probability of a swarm of cometary fragments hitting the Earth, Boslough et al. (2013) claimed that the YDB event is "statistically and physically impossible," whereas Napier et al. (2013) argued that such an encounter in the late Quaternary is a "reasonably probable event." We outline the latter hypothesis below; details and prime references are given in Napier (2015). With currently accepted impact rates, there is an expectation of one extraterrestrial impact of energy 100-200 megatons over the past 20,000 y, which is inadequate to produce the observed global trauma (Bland and Artemieva 2006). However, near-Earth surveys of hazardous interplanetary objects are limited to the past ∼30 y, and extrapolation of contemporary impact rates to timescales beyond 104 y cannot be justified without further investigation, especially for comet populations. Detailed microscopic investigations of horizons in a surface paleosol, part of a pedostratigraphic stack of tills at New Mountain, Antarctica, dated to the middle Miocene climatic optimum event (ca. 15 Ma), suggest not only that the paleoclimate history of the continent can be read from stratigraphic layers within paleosols but also that records of cosmic events may lie embedded in coatings on sand clasts resident in paleosols. Recent microscopic and chemical data from sands in the upper horizons of a surface paleosol (Ant-828), adjacent to the Taylor Glacier, contain Fe and Na coatings surfaced with cosmic signatures including welded and shock-melted grains, opaque carbon coatings, microfeature stack of cards, Fe spherules, solubilized grain surfaces with streams of melted skin, a grain carrying an Ir signature, rare earth elements elevated above crustal averages, and slightly elevated Pt/Pd ratios. Scientists have found a "highly unusual" particle enriched with uranium in the skies over Alaska's Aleutian Islands. The source of the substance, which is typically used in nuclear fuel and bombs, is still unclear. The mysterious substance "containing a very small amount of enriched uranium" was found at an altitude of 7km (4.3 miles) above Alaska's Aleutian Islands, according to a report issued by the Journal of Environmental Radioactivity. It is the first time the group of US scientists has detected enriched uranium-235 in their 20-year study. They were making no special attempt to sample radioactive material, when they came across it during a routine flight to check atmospheric conditions in August 2016. "During 20 years of aircraft sampling of millions of particles in the global atmosphere, we have rarely encountered a particle with a similarly high content of 238U [uranium-238] and never a particle with enriched 235U [uranium-235]," an abstract from the article says, with the full study to be published in April. Black dots represent locations of 129 lake cores exhibiting charcoal records and purple dots represent marine sites with charcoal and/or soot spanning the Younger Dryas onset. Some 13,000 years ago, a cataclysmic event occurred on Earth that was likely responsible for the collapse of the Clovis people and the extinction of megafauna such as mammoths and mastodons. That juncture in the planet's geologic history - marked by a distinct layer called the Younger Dryas Boundary - features many anomalies that support the theory of a cometary cloud impacting Earth. The collision triggered a massive biomass burning event, and the resulting soot, ash and dust in the global atmosphere blocked out the sun, which prevented photosynthesis - a phenomenon called impact winter. For more than a decade, UC Santa Barbara professor emeritus James Kennett has studied elements found at the Younger Dryas Boundary (YDB). He has collaborated with scientists around the globe, providing evidence at the YDB for a platinum peak as well as for spherules, melt glass, nanodiamonds and other exotic materials that can be explained only by cosmic impact. Kennett and his colleagues have now published new research in the Journal of Geology. In two papers, they analyze existing published scientific data from ice, glacier, lake, marine and terrestrial sediment cores, finding evidence for an extensive biomass burning episode at the YDB layer representing one of the most extreme events - if not the most extreme - ever experienced by our own species, anatomically modern humans. Recent extreme climate and burn events like those in California pale by comparison, Kennett said.